Search is over if you visit this immaculate *4 BED / 3 BATH* SINGLE STORY home, nestled in residential GATED COMMUNITY **Reflections at Storey Lake**. Walk through the extended front porch with and enter one of the most desirable floorplan by LENNAR HOMES, the *MARINA*. 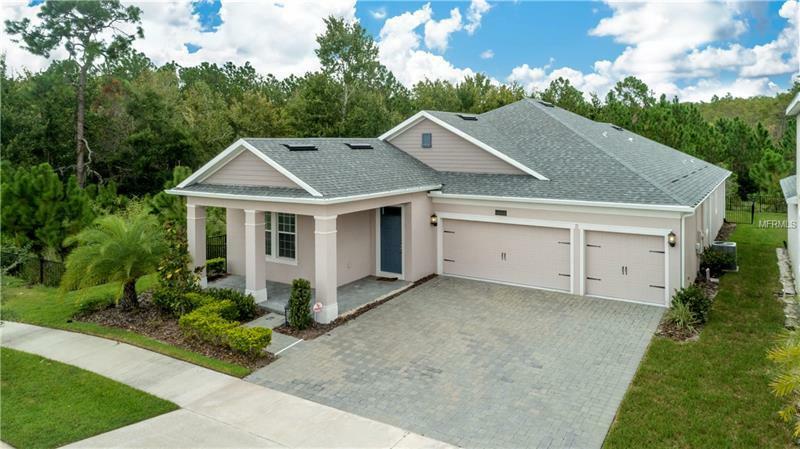 Grey 6â x 36â Ceramic Tile WOOD LIKE flooring throughout all common areas makes living spaces flow broadly from the foyer into the FORMAL DINNING ROOM connecting the ample OPEN KITCHEN and FAMILY ROOM. The Kitchen features grey GRANITE COUNTER TOPS, WHITE 42â upper cabinetry, and STAINLESS STEEL, GE brand appliances such as french door refrigerator, built in microwave, dishwasher, and glass top range. The MASTER BEDROOM is privately located with incredible views to the CONSERVATION AREA and the backyard. The EXTRA LARGE MASTER BATHROOM features double vanity, separate glass enclosure shower, tub and walk-in closet with access to the LAUNDRY. The 2nd and 3rd BEDROOMS located at the front section of the home feature a JACK n'JILL bathroom with double vanity. The 4th BEDROOM is conveniently located by the Family room. This home offers a 3 car garage. Be amazed by the vibrant ambiance and NATURAL LIGHT that permeates this home with many UPGRADES offered by the builder and impressive customized details that can be found in the MODEL HOME. The community offers a variety of amenities including GARDEN MAZE, DOG PARK and The Club house area has a POOL, GAME room and GYM. The monthly HOA fees includes high speed INTERNET and CABLE.